A Plastid is any member of a family of organelles found in the cells of all living plants and algae, but not in animals, and characterized by having their own copies of genetic material and by being enclosed in two membranes. Chloroplasts, chromoplasts, and leucoplasts are all plastids; mitochondria, which also have double membranes and their own genomes, but are present in all eukaryote cells, are not plastids (Alberts et al. 1989). The presence of plastids constitutes one of the major distinctions between plant and animal cells (Alberts et al. 1989). Plastids are the site of manufacture and storage of important chemical compounds used by the cell. Plastids often contain pigments used in photosynthesis, and the types of pigments present can change or determine the cell's color. Unlike mitochondria, which metabolize sugar and fatty acids to produce energy (captured by ATP), chloroplasts and chromoplasts utilize sunlight, via photosynthesis, as a source of energy. Leucoplasts, found in many epidermal and internal tissues that are not photosynthetic, include such forms as amyloplasts, which accumulate starch and can be very large in some plants, such as potatoes. In addition, to serve as sites for photosynthesis and storage, plastids also are sites for synthesis of purines and pyrimidines, amino acids, and fatty acids; in animals, these are made in the cytosol (Alberts et al. 1989). Plastids are believed to have arisen from an original symbiotic relationship between cyanobacteria and host cells, and thus plastids have their own genome and membranes. The presence of plastids in all plant cells reflects the common lineage and connectedness of all plants. Plastids are responsible for photosynthesis, storage of products like starch, and the synthesis of many classes of molecules, such as fatty acids and terpenes, which are needed as cellular building blocks and/or for the function of the plant. All plastids are derived from proplastids (formerly "eoplasts," eo-: Dawn, early), which are present in the meristematic regions of the plant. Proplastids and young chloroplasts commonly divide, but more mature chloroplasts also have this capacity. Long, thin protuberances called stromules sometimes form and extend from the main plastid body into the cytosol and interconnect several plastids. Proteins, and presumably smaller molecules, can move within stromules. Most cultured cells that are relatively large compared to other plant cells have very long and abundant stromules that extend to the cell periphery. Each plastid has a relatively small genome. Each plastid creates multiple copies of the circular 75-250 kilo bases plastid genome. The number of genome copies per plastid is flexible, ranging from more than 1000 in rapidly dividing cells, which generally contain few plastids, to 100 or fewer in mature cells, where plastid divisions has given rise to a large number of plastids. The plastid genome contains about 100 genes encoding ribosomal and transfer ribonucleic acids (rRNAs and tRNAs) as well as proteins involved in photosynthesis and plastid gene transcription and translation. However, these proteins only represent a small fraction of the total protein set-up necessary to build and maintain the structure and function of a particular type of plastid. Nuclear genes encode the vast majority of plastid proteins, and the expression of plastid genes and nuclear genes is tightly co-regulated to allow proper development of plastids in relation to cell differentiation. Plastid DNA exists as large protein-DNA complexes associated with the inner envelope membrane and called "plastid nucleoids." Each nucleoid particle may contain more than 10 copies of the plastid DNA. The proplastid contains a single nucleoid located in the center of the plastid. The developing plastid has many nucleoids, localized at the periphery of the plastid, bound to the inner envelope membrane. During the development of proplastids to chloroplasts, and when plastids convert from one type to another, nucleoids change in morphology, size and location within the organelle. The remodeling of nucleoids is believed to occur by modifications to the composition and abundance of nucleoid proteins. In algae, the term leucoplast (leukoplast) is used for all unpigmented plastids. Their function differs from the leukoplasts in plants. Etioplast, amyloplast, and chromoplast are plant-specific and do not occur in algae. Algal plastids may also differ from plant plastids in that they contain pyrenoids. Most plants inherit the plastids from only one parent. Angiosperms generally inherit plastids from the maternal source, while many gymnosperms inherit plastids from the paternal source. Algae also inherit plastids from only one parent. The plastid DNA of the other parent is, thus, completely lost. In normal intraspecific crossings (resulting in normal hybrids of one species), the inheritance of plastid DNA appears to be quite strictly 100 percent uniparental. In interspecific hybridizations, however, the inheritance of plastids appears to be more erratic. Although plastids inherit mainly maternally in interspecific hybridizations, there are many reports of hybrids of flowering plants that contain plastids of the father. Plastids are thought to have originated from endosymbiotic cyanobacteria about 1,500 million years ago (Hedges et al. 2004). The original symbiotic relationship between organisms proceeded to the point that the enclosed cyanobacteria became an organelle of the host organism, allowing plastid-containing eukaryotes to carry out oxygenic photosynthesis. Thus, plastids are surrounded by double composite membranes with intermembrane spaces, have their own DNA, and are involved in energy metabolism, and have reticulations, or many infoldings, filling their inner spaces. The inner membrane of plastids in green plants is thought to correspond to the outer membrane of the ancestral cyanobacterium. The chloroplast genome is considerably reduced compared to that of free-living cyanobacteria, but the parts that are still present show clear similarities. Many of the assumed missing genes are encoded in the nuclear genome of the host. A split into three evolutionary lineages is accompanied by different characteristics and names for particular plastids in the three groups: Chloroplasts in green algae and plants; rhodoplasts in red algae; and cyanelles in the glaucophytes. These plastids differ by their pigmentation and also in ultrastructure. The chloroplasts, for example, have lost all phycobilisomes—the light harvesting complexes found in cyanobacteria, red algae, and glaucophytes—but (only in plants and in closely related green algae) contain stroma and grana thylakoids. 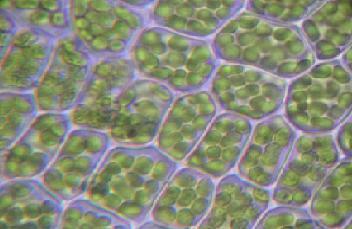 The glaucocystophycean plastid, in contrast to the chloroplasts and the rhodoplasts, is still surrounded by a remains of the cyanobacterial cell wall. All these primary plastids are surrounded by two membranes. Complex plastids are believed to originate from secondary events of endosymbiosis, when a eukaryote cell engulfed a second eukaryotic cell containing plastids, forming plastids with more than two membranes. For example, the second event could be the engulfing of a red or green algae and retention of the algal plastid, forming a plastid with three or four membrane layers. In some cases, such secondary endosymbionts are theorized to have themselves been engulfed by still other eukaryotes, forming tertiary endosymbionts. In some cases, these plastids may be reduced in their metabolic and/or photosynthetic capacity. Algae with complex plastids assumed to have been derived by secondary endosymbiosis of a red alga include the heterokonts, haptophytes, cryptomonads, and most dinoflagellates (= rhodoplasts). Those that involved endosymbiosis of a green alga are assumed to include the euglenids and chlorarachniophytes (also called chloroplasts). The Apicomplexa, a phylum of obligate parasitic protozoa including the causative agents of malaria (Plasmodium spp. ), toxoplasmosis (Toxoplasma gondii), and many other human or animal diseases, also harbor a complex plastid (although this organelle has been lost in some apicomplexans, such as Cryptosporidium parvum, which causes cryptosporidiosis). The "apicoplast" is no longer capable of photosynthesis, but is an essential organelle, and a promising target for antiparasitic drug development. Some dinoflagellates take up algae as food and keep the plastid of the digested alga to profit from the photosynthesis; after a while, the plastids are also digested. These captured plastids are known as kleptoplastids. Bhattacharya, D. (ed.) 1997. Origins of Algae and their Plastids. New York: Springer-Verlag/Wein. ISBN 3211830367. Birky, C.W. 2001. The inheritance of genes in mitochondria and chloroplasts: Laws, mechanisms and models. Annual Review of Genetics 35: 125-148. Hanson, M.R., and R.H. Köhler. 2006. Essay 7.1: A novel view of chloroplast structure. Plant Physiology. Retrieved July 11, 2008. Wycliffe, P., F. Sitbon, J. Wernersson, I. Ezcurra, M. Ellerström, and L. Rask. 2005. Continuous expression in tobacco leaves of a Brassica napus PEND homologue blocks differentiation of plastids and development of palisade cells. Plant Journal 44(1): 1-15. Retrieved July 11, 2008. This page was last modified on 22 July 2008, at 14:10.